A resume for Bettye Reagan (b. 1934), a pastel painter based in Lake Mary, Florida. Born on January 27, 1934, Reagan is the granddaughter of Andrew Aulin, Sr. (1843-1918), who is credited with naming Oviedo. Reagan married Joel Edwin McGill in 1952 and the couple had two children together: Daniel Lee McGill (1953-) and Kathleen Ann McGill (1955-). After McGill's death, Reagan married Donald Thomas Reagan (1923-) in 1956. Together, the couple had four children: Debbie Lynn Reagan (1958-), Julie Karin Reagan (1959-), Andrew Scott Reagan (1961-), and Patrick Kelley Reagan (1962-1986). 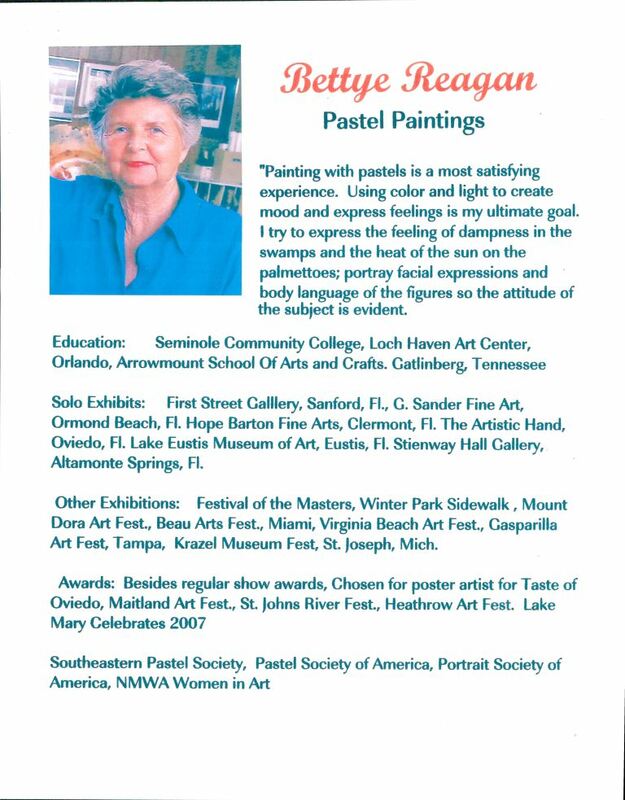 Original resume, 2009: Private Collection of Bettye Reagan. Digital reproduction of original resume, 2009. 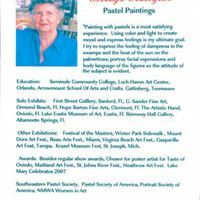 “Bettye Reagan Pastel Paintings.” RICHES of Central Florida accessed April 22, 2019, https://richesmi.cah.ucf.edu/omeka/items/show/6929.